Summer is here and it’s time for fresh, easy and quick recipes so you can be out at the beach or by the pool instead of working hard in the kitchen. And hey, it never hurts to make dishes that you can eat outside WHILE you’re enjoying the beautiful weather. With only a few simple ingredients and a sharp knife, this light and refreshing ceviche will definitely become a staple in your house. Unlike a traditional ceviche, which can include tons of ingredients to chop like jalapenos, avocado, red onion, bell peppers and garlic, I’ve developed a simple recipe inspired by Israeli salad using tomatoes, cucumbers, parsley and fresh lemon juice. Not too much chopping but an incredible amount of flavor. Since I usually enjoy Israeli salad with fresh pita bread and I love to snack on ceviche with crunchy taco chips, I decided to bake my own healthy and oil free homemade tortilla chips for this combination Israeli Salad Ceviche. I flavored my baked corn tortillas with cumin and salt but you can use whatever spices you want on your own chips, including garlic, chili powder, turmeric or whatever else your heart desires. They’re your chips! Preheat the oven to 400 degrees F and prepare a baking sheet with cooking spray. Slice the corn tortillas into triangles and place them on the baking sheet in one layer, making sure none of the tortilla pieces are touching. 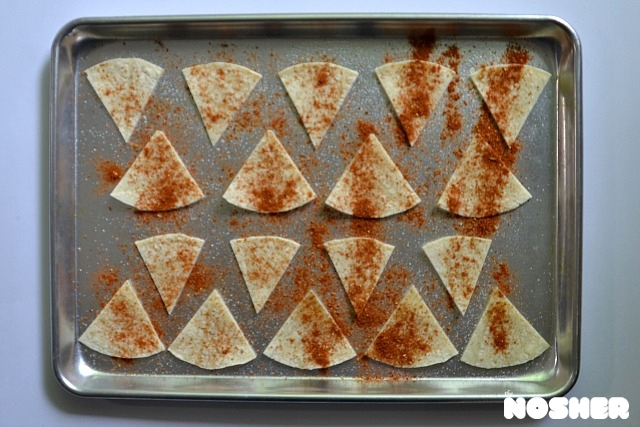 Sprinkle the tortillas with the salt and cumin and bake for 8-12 minutes, until the chips are crunchy. Set them aside to cool and harden even further. Store the chips in an airtight container for up to 1 week. Chop the Persian cucumbers, heirloom cherry tomatoes and sushi-grade tuna into small pieces, making sure that the pieces are all similar in size. Add the chopped fresh parsley, lemon juice, olive oil, salt and pepper and stir to combine. 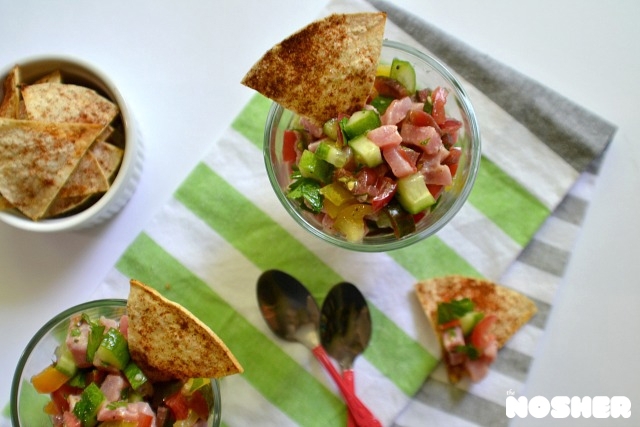 Set the ceviche aside for 5 minutes for the tuna to cook slightly in the acidic lemon juice. Ceviche is better fresh but can be refrigerated for 1-2 days. The fish will cook in the lemon juice so be prepared for cooked fish if you are eating leftovers the next day. Albondigas, or meatballs, are a mainstay of Sephardic cuisine.